Though the mantra “reuse, recycle, reduce” is a foundation of the sustainability movement, in some cases, reusing isn’t best. Replacing old appliances with new, efficient models is the surest way to cut long-term energy costs. ENERGY STAR®, an Environmental Protection Agency program, has simplified the shopping process by offering the ENERGY STAR® label for appliances. Such products, whether they’re dishwashers, clothes washers, or freezers, have been vetted to be certain they use less energy and natural resources and help you save money. Running full loads of laundry or when running the dishwasher. Washing clothes in cold water to save $63 per year. Turning off the drying feature on your dishwasher. Hanging out clothes to dry in the sun. Using a microwave, rather than a stove for cooking. Keeping the refrigerator away from direct sunlight and setting the temperature between 36 degrees and 38 degrees F.
Product tags typically outline the appliance’s benefits. ENERGY STAR refrigerators use about 15% less energy than non-certified models. Opting for a certified new fridge rather than a standard one can save you $80 in energy bills over the lifetime of your fridge. 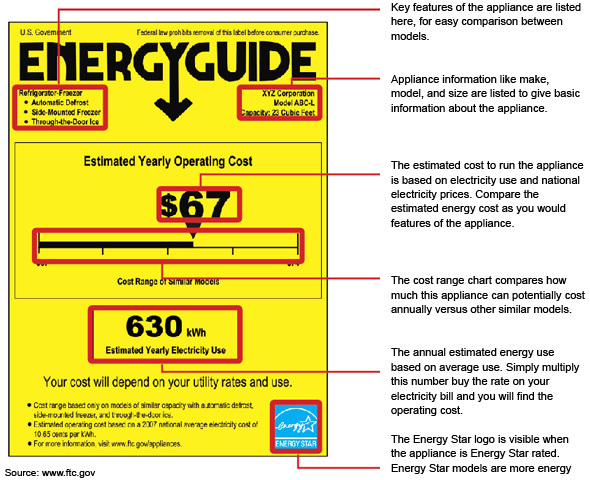 Calculate potential savings at EnergyStar.gov. Dishwashers with the ENERGY STAR label are, on average, 10% more energy efficient and 20% more water efficient than standard models. Pre-1994 dishwashers cost $40 per year more in energy than those with the ENERGY STAR label.